Guests to Baltimore Woods have a unique opportunity to enjoy nature both outside and inside. The Baltimore Woods Art Gallery celebrates nature from a variety of artistic perspectives with five distinct exhibits each year, September through May. The gallery is located in the Large Program Room in our Interpretive Center and is open to the public during operating hours with no admission charge. With the exception of the Student Art Exhibit which is held in May, all of the artwork is for sale. A portion of the proceeds raised from the sale of artwork goes to support the mission of nature education at Baltimore Woods Nature Center. For more information about the gallery, contact the gallery coordinator, Karen Jean Smith, at gallerycoordinator@baltimorewoods.org. Have you noticed? There are far fewer fireflies in our backyards than just ten years ago. The monarch butterfly populations are in serious decline, as are native species of bumblebees. 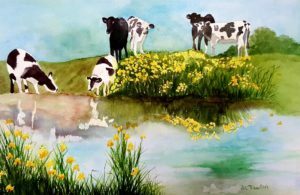 Artist Ellen Haffar draws attention to concerns for these little beings in an exhibit of paintings titled, “Backyard Serengeti”. 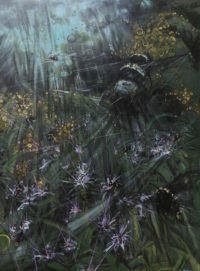 “The energy of insects and the dioramic spaces discovered in a garden, a meadow, or a hedgerow inform my compositions and layered surfaces.” states Haffar. 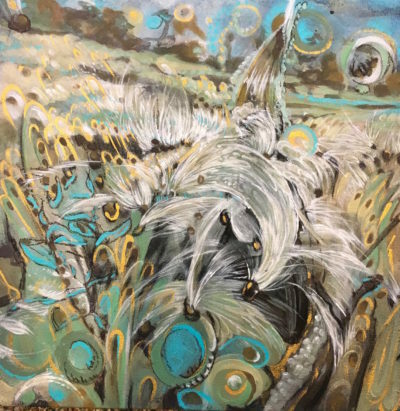 “Dynamic and full of vibrating life, my paintings seek to capture the complexity and richness of invertebrate species and their ecosystems.” Haffar lives and works in the hills of Pompey in upstate New York. Her work is often infused with color and nearly always influenced by nature and a sense of place. She holds degrees from SUNY New Paltz and Syracuse University. 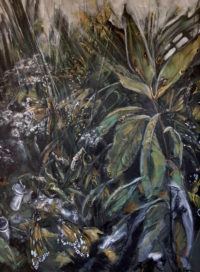 Her work has been exhibited extensively and is held in collections both nationally and internationally. Hours: The Art Gallery is open inside the Interpretive Center M-F, 9-4 and Sat, 10-4. Closed Sundays and major holidays. Trails are open dawn to dusk every day with parking in upper or lower lots. No dogs please. If you would like to receive more information about upcoming art exhibits at Baltimore Woods, click on the button below to subscribe. Your email will only be used to send you news about our gallery programs and will not be shared with any outside organizations. You may unsubscribe at any time. Although generally open to the public, the program room is occasionally used for nature themed classes and private parties. Those interested in the gallery may wish to call before their visit to be sure that the program room will not be in use when they arrive. 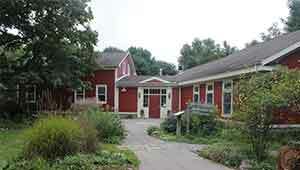 Educational exhibits of art work with a central New York nature theme are of special interest to the Nature Center. Contact the Gallery Coordinator for more information. 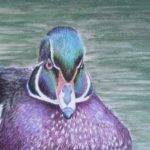 How can I have my artwork shown in the Baltimore Woods Art Gallery? All members of The Woods are invited to submit work to our annual non-juried exhibit held in November and December. Look for the prospectus in the Fall newsletter. Artists chosen for our individual shows are often "discovered" at the Members Exhibit.